Welcome to Freehold website visitor and Freehold native, Carol Hulse Benton's Grandfather, William D. Hulse, was elected Constable of Freehold in 1911. Carol recently came across a scrapbook kept by Constable Hulse. This scrapbook contained numerous news- paper articles of the cases in which he was involved and Carol has generously volunteered to transcribe and share them with us. Because some of the people and some of the relatives of the people written about in the articles still reside in the Freehold area, Carol has used only the initials because she thought it would be prudent to protect the innocent and the guilty named in some of the articles. Please enjoy the stories of the high crimes and misdemeanors that took place in Freehold New Jersey almost 100 years ago. For leaving his horses unprotected by shelter of any kind from the elements Samson Palmer, a member of a large band of Gypsies encamped near Bergen's mills, was arrested by L.N. Bohannan, special state officer for Mrs. Jasper Lynch, of Lakewood, of S. P. C. A. fame, and brought before Justice of the Peace J.W. Hulse Wednesday, where a fine of $50 and costs, amounting to a cot of$55.10, was imposed. The fine was paid after Palmer had been in the county jail a few hours, by another Gypsy who said his name was Williams, and who claimed to have come from Trenton for the purpose of securing the freedom of his brother. Complaints had been received by Mrs. Lynch at Lakewood of the horses at the Gypsy camp being left out in the cold storms unprotected. She sent officer Bonhannan to investigate on Tuesday afternoon. He enlisted the services of Constables William D. Hulse and George C. White and Wilson D. Hankinson, night watchman and special officer. The camp was reached about eight o'clock Tuesday night. When the officers alighted from their automobile and started to go through the woods in which the camp was located, one of the women members of the tribe began screaming a warning to the others. Immediately there was great confusion in the camp. The male members of the band untethered their horses and began a flight through the woods, while women gathered about the officers, rebuking them for the invasion of their camp. One of the women struck Mr. Hankinson over the head with a club, inflicting a scalp wound. Constable Hulse followed a trail through the woods until he located Palmer with his three horses and conducted him back to camp. Palmer deserted his horses again and slipped back into the depths of the woods, and the officers place the three horses in a barn and returned to Freehold. Wednesday morning Officer Bohannan and Hulse returned to the barn where they left the horses and there found Palmer and placed him under arrest. When brought before Justice Hulse he declared that he had kept his horses in a barn near the camp, and had intended returning them to the barn as soon as he had had his supper. He said that he had a wife and eight children dependent upon him; that there were six families in the camp, all closely related, and that the horses which had been kept in the woods belonged to other members of the band. CHAUFFEUR IS ARRESTED, TWO YOUNG WOMEN SPILLED OUT OF MACHINE WEDNESDAY NIGHT. While returning home from the Red Bank carnival at a late hour Wednesday night, S. G., in his Maxwell runabout, was run into by a large Packard touring car, owned by Isaac A. Bach, of 9 East 92 nd St, New York, and driven by Felix Faust, his chauffeur, who was enjoying a joy ride. Mr. G's machine was wrecked almost beyond repair, and tow young women, Miss Holly H. and Miss Ellen C, who had been to the carnival with him, were thrown out by the impact. Miss C sustained slight abrasions about the face and shoulders, but the others escaped injury. The accident happened in front of Frank Hyers place on the Colt's Neck road about 11:30. The two wheels on the left side of the machine were ripped off, the machine was turned almost completely about, the frame work and machinery so broken and twisted as to be almost beyond repair. All of the spokes in the left front wheel of the Packard car were broken and the wheel dropped to the ground, but such was the momentum of the big machine that it slid the axle along the ground about 100 feet. Mr. Bach with his family, is summering at Elberon. With Mr. Bach's daughter and two young women who were visiting the family, Faust started out for a ride Wednesday afternoon. At Colt's Neck a tire bursted and the chaufffeur telephoned his employer his predicament. A new tire was sent him in another machine, but in the meantime the young women returned home with some friends that happened to pass. Faust, it is alleged, drank some intoxicants while at Colts Neck, and when he had finished his repair work, about 8 o'clock that evening, he came to Freehold, instead of returning to his employer's home. Here, it is again alleged, he visited some cafes, and he was seen by several townspeople driving his car recklessly about the streets. Mr. G, when he met him on the Colts Neck road turned far to the right, but Faust turned into Mr. G's machine wit the result as above stated. The chauffeur again telephoned his employer, who came up that night while both parties were still there, and promised to return the next morning to adjust matters. Mr. G and the young women were brought home by Charles Clayton, who was telephoned for. With his counsel, R. V. Lawrence and William T. Buck, Mr. G returned to the scene of the accident next morning about 8 o'clock, and found Faust, the chauffeur, asleep in the car. Returning to Freehold the secured a warrant for the arrest of Faust on the technical charge of assault and battery. A photographer and Constable William D. Hulse were taken along this time. Photographs and measurements were taken of the scene and Faust was placed under arrest and brought before Justice of the Peace J.W. Hulse. Bail was fixed at $600 and Mr. Bach, who accompanied the party to Freehold, volunteered to become his bondsman. As he had no property in this state, he could not go on bail bonds, however, so he returned to his home and secured $600 in cash, which he deposited with Justice Hulse about 4 o'clock yesterday afternoon, and Faust, who had been in jail in the meantime, was released. Marshal Smith and Constable Hulse make a surprise visit in lumber yard. A gang of crapshooters,consisting of some ten young men, were routed out of Combs & Company's lumber sheds Sunday by Marshal John M. Smith and Constable William D. Hulse. The young men were surprised in their retreat in the loft of one of the lumber sheds and were so situated that none could escape. Anthony Deedmeyer, the active member of the firm, who had summoned the officers, at first ordered the minions of the law to have the offenders locked up. The lads pleaded so hard for their liberty however, that Mr. Deedmeyer's heart was softened, and upon their promising that they would never visit the lumber yard again on such an errand, they were allowed to go. Another crowd of young men had congregated in the round house of the Pennsylvania for the same purpose, it is alleged, and they became alarmed at the appearance of the officers in that vicinity and fled. A Pennsylvania Rail Road detective was in Freehold a few days ago securing evidence against the young men who gather on their property, and if the practice continues someone will get into trouble. Five Freehold boys held under $50 Bail for stealing beer. Five Freehold boys were held under $50 bail each by Justice of the Peace J.W. Hulse last Friday to await the action of the gand jury onc charges of stealing beer from the wagon of Fred Hess of near Englishtown. The beer is alleged to have been stolen Monday night of last week while standing in the American House sheds. Mr. Hess had left a small boy, whom he had brought with from home, with the wagon. Constable William D. Hulse heard the boy crying and upon going to investigate, the lad said some boys had stolen a half dozen bottles from under the wagon and attempted to take some other goods. The officer caught one of the alleged offenders and from him secured the names of the others. Complaint was made before Justice Hulse by Mr. Hess and by Friday night Lester B., John F., Raymond S., Frank Mc N and Arnold D. were summoned to the Justice's office and required to furnish $50 bail each. E.Simonson, E.I. Vanderveer, W.A.Hankinson Sr. and Jr. and L. Deedmeyer were the respective bondsmen. if they continue to congregate there, even though they are alert enough not allow such an intruder as the sturdy little constable to catch them with the bones upon the ground. Mrs. G.C's Neck Broken in Runaway, Husband Walked to Colts Neck, Leaving Wife in Gutter. Mrs.SJC, wife of GC of Colts Neck, met death in a runaway accident in Freehold late Saturday night, and her husband dazed by drink or by the accident, left his wife's body in the gutter with the horse and wagon and walked to his home, five miles distant. Questioned by his son, G, as to the whereabouts of his mother, and the rig, when he arrived home at 3 o'clock in the morning, Mr. C professed entire ignorance of either. The son, along with a son-in-law, walked to Freehold at 5:30 Sunday morning and found Mrs, C's remains in George Freeman & Son's undertaking parlors. Mr. and Mrs. C drove to Freehold early Saturday evening and Mrs. C remained in the wagon while her husband did some shopping. His shopping tour included several visits to the local hotels and Mrs. C was noted sitting in the wagon in the street until a late hour. It was about 11 o'clock when Uriah Mc Daniels finally succeeded in persuading Mr. C to get into his wagon and to go home with his wife. About 12 o'clock, the horse and buggy were found overturned in the gutter on East Main Street, near the town boundary line by three farm hands who were employed near Colts Neck. They had passed the spot, when they heard the horse groan. Walking back a few paces, they found the horse on its back in the gutter with the wagon overturned. Because of the dense darkness they did not attempt to right the horse or carriage, but by what light they could get from a few matches they discovered what they took to be the form of a man in the wagon. Returning to town they notified Marshal John M. Smith of the find. Mr. Smith with Assistant Marshal Chas. H. Crawford and Constable William D. Hulse, secured a lantern and visited the scene. They found the body of Mrs. C with her head near the horse's haunches and her feet resting in the top of the wagon. The buggy was completely overturned and the horse was on its back with his feet resting on the bank and unable to rise. Dr. H.W.Ingling was called and he announced that Mrs. C's neck was broken. George M. Freeman&Son were called to take the body to their undertaking parlor and Coroner Robert M. Purdy was notified by telephone. Mr. Purdy arrived in Freehold at 4:15 a.m., and again visited Freehold Monday. After going over the facts in the case with all of the witnesses procurable he decided than an inquest was unnecessary and a burial permit was issued. Mr. C was arrested by Constable Wm. D. Hulse yesterday afternoon, under orders from the Prosecutor John S. Applegate, Jr., and taken before Justice of the Peace J.W. Hulse, who committed him to the county jail without bail to await the action of the grand jury on a charge of manslaughter. The authorities say that Mrs. C's was undoubtedly the result of an accident, but due to the carelessness of Mr. C. Criminal Carelessness resulting in a person's death, is equivalent to manslaughter under the law, and if it can be shown that Mr. C was criminally careless in driving his horse in the ditch, he may be convicted of manslaughter. Determined to break up the practice of a certain element of carrying concealed weapons, Freehold officers are now looking for AC, who last Saturday night caused a commotion on Throckmorton Street by flourishing a revolver among a crowd of people. Policeman John W. Errickson saw trouble brewing but not caring to face a loaded revolver alone, blew his whistle for assistance. Policeman John M. Smith and Constable Wm. D. Hulse answered the call for help and C started to run away. Hulse and Smith gave chase, with Hulse in the lead. AC ran to Broad Street, up Broad Street to Manalapan Avenue to George Street. Here he cut across lots, going through the yard of Jacob Perrine and smash down a garden truck. In climbing the fence at the side of the house, he broke one paling and left his hat hanging on the fence and the policemen abandoned the chase. In the mean time Policeman Errickson had held up two other men on suspicion of having weapons. Nothing was found upon them and they were allowed to go but a revolver was found in the grass where one of the number must have thrown it. C, the fleeing man turned upon Constable Hulse when in front of the Military school on Broad street and fired a shot without effect. Charged with forging the name of a man who had many times befriended him, to a check for $25, and cashing it at D.V. Perrine's Big Red store in Freehold, John T. H. was arrested at Red bank on Monday and brought to the county jail that evening in default of $500 bail, to await the action of the grand jury. The young man, who comes from a prominent Monmouth county family, is said to have led rather a wild life, but has never heretofore been in any serious trouble. 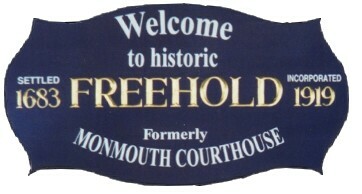 Last week he spent several days in Freehold, where he is well known. He borrowed $2 from D.V. Perrine during the week, and on Friday he returned to the store and suggested to Mr. Perrine that if he would cash him a check for $25 he would pay him the $2 he had borrowed. Mr. Perrine did as requested. The check was signed with the name of William Hartshorne, of Colts Neck. Mr. Hartshorne, when acquainted with the facts, declared the signature on the check a forgery and made a complaint before Justice of the Peace J.W. Hulse, who issued a warrant and placed it in the hands of Constable William D. Hulse. Having reason to believe that Mr. H was in Red Bank, Constable Hulse gave the warrant to Policeman Frank Estelle, who had brought some prisoners to the county jail, with request that he arrest H. The Red Bank Officer arrested H. immediately upon reaching Red Bank, and the prisoner was brought to Matawan, where Constable Hulse met him and brought H. to the county jail. Mr. H. was examined by Dr. H.W. Ingling, of Freehold, and Dr. Howard Forman, of Jersey City, yesterday. He was declared to be mentally unbalanced by both physicians, and in accordance with their report papers have been prepared committing H. to the New Jersey State Hospital at Trenton. Residents of that section of Freehold lying east of the Central railroad tracks were aroused about 9:30 o'clock last Friday night by a melee among a number of Polish men, one of whom was shouting murder, help, etc., at the top of his voice. Martin M., employed in the section gang of the Central railroad, asserted that a number of his countrymen who boarded with him at the Rabbi's house had attempted to rob and kill him. He was taken before Justice of the Peace James S. White where complaint was made, and Constable Hulse was sent to arrest his assailants. At the Rabbi's house he found J and J. G. in bed and M identified them as his assailants and Constable Hulse took them before Justice Hulse who committed them to the county jail to await the action of the grand jury. Saturday morning M came again before Justice Hulse with an interpreter and also entered a complaint against JR and JM for having participated in the assault upon him. Constable Hulse arrested R while he was a work in Brakeley's gang(field workers) on the Schanck farm and he apprehended M in another of Brakeley's gangs on the David Buck farm. Both of these men were also held for the grand jury. Martin M was examined by a physician Saturday and the latter found that besides numerous bruises, the victim had received two broken ribs in the melee. He is now charged with Stealing Rev. McElwaine's Chickens. The arrest of George D., by Constable William D. Hulse last Sunday morning, will ease the minds of many who know D best and who are never at ease when D is at liberty. He is considered a thoroughly bad man and many will be disappointed to know that he was arrested only on the charge of stealing chickens. D., it is alleged, has served time in state prison on a conviction of manslaughter, for killing a man near Pineland Park some years ago. At any rate, A.P. Johnson, who held the warrant for his arrest Sunday, says that he arrested him nearly 20 years ago for stealing chickens, and he has been under arrest a number of times since. On or about January 3rd last, the chicken roost of Reverend Denise Mc Elwaine, near Robertsville, was entered in the night and 25 chickens stolen. D, it is alleged, delivered about that number of fowls to a dealer at Matawan shortly after that date. Complaint was made by Mr. Mc Elwaine and Mr. Johnson has been on the lookout for him ever since. Learning that he was at home Saturday night, Mr. Johnson, who has been confined to the house by rheumatism several days, secured the aid on Sunday morning of Constable William D. Hulse and Charles Crawford and also took him Edward Lawrence, who for a number of years was constable at Mt. Holly. Arrived at the man's home Mesrss. Hulse and Lawrence left the wagon and started to surround the house. D saw the officers coming and he left the house and started on a run for the swamp. Mr. Hulse and Mr, Lawrence ran after him and when Mr. Hulse leveled his revolver and ordered him to halt, D obeyed and submitted to the officer placing the handcuffs on his wrists. He was brought to the county jail and held for the grand jury. Search Two Nights for Men Thought to be ARMENIAN HUNCHAKISTS. A little excitement was created in Freehold Monday by the appearance of three strange men believed to be Armenians. At once a story became noised about that the men were suspicioned of being members of the Hunchakists society or a band of blackmailers who have been sending blackhand letters threatening the life of A. Karagheusian, proprietor of the Freehold carpet mills and, other wealthy Armenian merchants in this country. The four men mentioned approached Policeman Smith on the street Monday afternoon and inquired of him where Dr. Breslin lived. They were given the information they sought but they made no move to go on to the Breslin home, corner of Mechanic and Jackson Streets. That night Policeman Smith stationed himself in the vicinity of the Breslin home and walking in the rear of the mills he saw the same four men standing in a group talking. At his approach they ran away. He then summoned Edward Cashion, Jr., Edward Cashion, Sr., Marshall A.P. Johnson and Constable William D. Hulse and the four men made a through search of the fields contiguous to the mills but no trace of the men could be found. W. D. HULSE MAKES IMPORTANT ARREST ON EAST MAIN STREET. Constable William D. Hulse again proved his mettle. Saturday morning when he arrested a man at the home of Fredrick E. Anderson, 68 East Main Street, as a suspicious character and brought him before Justice of the Peace C. B. Barkalow, who committed him to the county jail to await the action of the grand jury on a charge of carrying concealed weapons. The prisoner says his name was Frank Shultz and his age is 20 years. Constable Hulse had been given a description of a man wanted at Perth Amboy for sneak thieving. With the description of the man wanted came the information that the man had operated in that city by claiming to be a telephone representative, gaining access to the house for the ostensible purpose of repairing the telephone and sneak through the rooms and steal everything he could conveniently carry. While at the Central Railroad depot Saturday morning Mr. Hulse saw a man lounging about that he thought fit the description of the man wanted. When the stranger finally sauntered away Constable Hulse sauntered, too. He followed his man about town until he mounted the steps at Mr. Anderson's house and boldly rang the front door bell. A servant answered the summons at the door and asked what was wanted and the stranger told her he wanted to repair the telephone. At this juncture Mr. Hulse became possessed of a desire to scrutinize his man at closer quarters and without the formality of introduction he boldly walked the steps and inquired of the man what his business was. The stranger replied that he worked for the telephone company and wanted to go into the house to repair the 'phone. Constable Hulse was then desirous of seeing the telephone man's badge. The stranger could produce no such commodity and he then received the information that his general appearance and his alleged business fit the description of a man the officer was looking for and the information that he would have to accompany the officer up town was given in a more positive manner when Mr. Hulse not only produced a badge but a pair or wristlets. The stranger went all right and when searched at the county jail his pockets were found to contain a 32 calibre revolver, a saw blade, a chisel and thin-blade knife. When these weapons and implements were found upon him, he was promptly committed to jail on a charge of carrying concealed weapons. This charge will suffice to keep him in jail here until he is identified as the man wanted at Perth Amboy and if he should prove not to be the man wanted there he will be tried and sentenced on the charge preferred here.